"At October's Sup n Sew (2012), Sheri shared with us a quilt she had just made. It is from a pattern which was a handout from The Tattered Rabbit (no longer in business). "Easy Quilt on Point is created by sewing charm squares or any size squares together, then following the directions (in the pattern) cut your quilt and re-sew it as shown to put the quilt on point!! 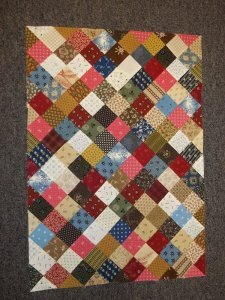 It is a fun and fast project and looks like you spent all day sewing diagonal rows. Hope you enjoy this fun little quilt!"